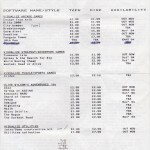 One of his ideas was to take the entire back catalogue of Clive Wilson adventure titles and update them with new graphics, music and intros. “ZZzz” in the end was to be the only title which saw the light of day from Jon. The Darkest Road was a solid budget adventure back in the day, and Jon was planning to give the game a new lease of life.